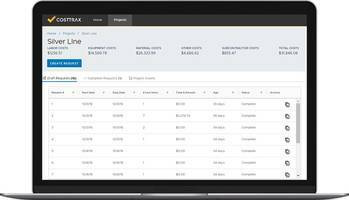 CostTrax Material Tracking Software is designed for managing cost, time and material in construction projects. The software streamlines reporting and automatically flags questionable expenses. The CostTrax provides accessibility from any computers or device with an internet connection. It is suitable for cities, counties, construction managers and owner's representatives. ATLANTA, Jan. 17, 2019 /PRNewswire/ -- Construction project owners have a powerful new tool to manage cost-plus, time and materials, and force account construction projects. CostTrax, powered by EquipmentWatch, is a new software solution that streamlines reporting, automatically flags questionable expenses, and ensures every reimbursement request is 100 percent compliant. CostTrax is entirely web-based and requires no software to download — it can be accessed from any computer or device with an internet connection. It is unique in its ability to leverage third-party datasets to verify rate compliance. Data integrations, such as ownership and operating costs from the Rental Rate Blue Book and local rental market pricing from EquipmentWatch, give project owners critical new rate intelligence to prevent overpayment.